 HDMI Receiver supports resolution up to 1080p, and HDMI Transmitter supports resolution up to 4Kx2K. Support HDMI repeater function. Chrontel CH7038B is an innovative display interface product designed for embedded systems, consumer electronics and computing in which conversions among multiple high definition video/audio formats are required.Built in with multiple differential receivers and transmitters, a flexible scaling/overlay engine and easy-to-use audio interfaces, the CH7038B can drive LCD panels through either a single or dual channel LVDS/TTL interface or a 1/2 lane DisplayPort interface. It can also simultaneously output to external displays using standards such as HDMI/DVI, YPbPr, VGA, CVBS or S-Video.This device will help manufactures reduce design costs,accelerate time-to-market and expand product features for better user’s experience. The CH7038B has four input and four output ports to supports multiple display standards. Some ports are multiplexed with different signal types to reduce pin count. For example, the 24-bit wide digital port can be programmed to receive LVDS or TTL signals and supports various formats like RGB, BT1120, BT656, etc.while the 8-bit port can accept HDMI or BT656 inputs.The 2 Lane DP / eDP port stands alone because of its high data transfer rate. The lower speed SPI port can interface to external micro controller to display selectively refreshed data.A powerful per pixel scaler engine is integrated inside the CH7038B. Together with its stacked 64Mb SDRAM, the scaler can process input resolutions up to 1080P and perform Frame Rate Conversion, Image Rotation/Flip and flexible Video Zoom. It can overlay a scaled video onto another bypassed graphics stream to achieve picture-in-picture display. This would allow user to view two display contents on a single monitor. The scaler also supports chroma-key to overlay irregularly shaped video with monochrome background onto a second video stream. Though its MCU and SPI interface, external micro controller can input complex OSD data into the overlay buffer using the selective refresh mode. These features make CH7038B an ideal solution to display multiple video sources onto multiple displays. Through a 4x2 input switch matrix, the device’s scaler can be configured to simultaneously accept two separated video formats with independent display timing. The input combination can be mixed among the TTL/BT1120/LVDS, the DP/eDP, the HDMI/BT656 and the SPI interface input in either RGB format (RGB-565, RGB-666 or RGB-888 and etc.) or YCrCb format (ITU-R601/656 and BT1120). A 2x4 output switch matrix can be programmed to drive the various output ports simultaneously with two kinds of independent timing. 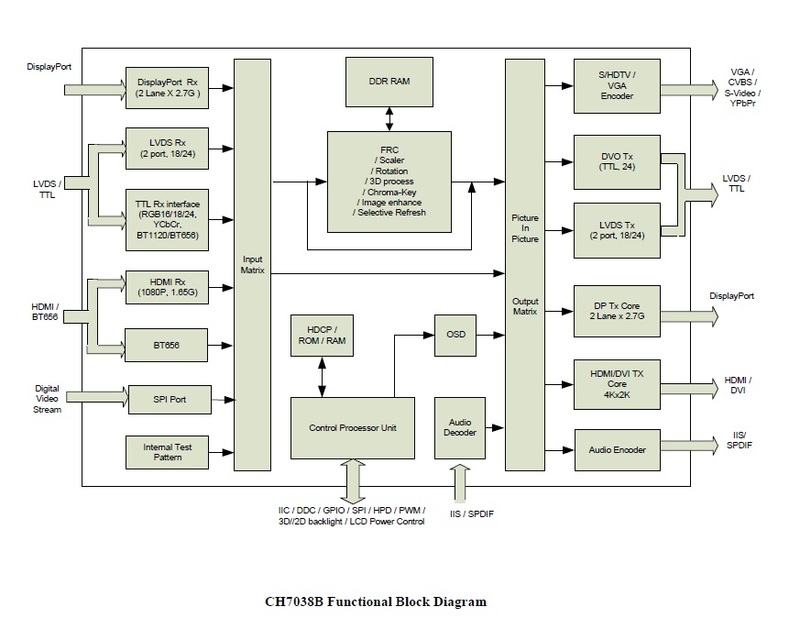 The CH7038B supports 3D data structures defined by DP and HDMI standards. The device can translate and repack 3D data when DP signals are converted to HDMI and vice versa. 3D data can also be displayed as R/L frame via its LVDS output. The CH7038B’s DisplayPort receiver and transmitter are designed to comply with DisplayPort Specification 1.2 and Embedded DisplayPort (eDP) Specification version 1.3. It provides support for one or two Main Link lanes with data rate running at 1.62Gb/s or 2.7Gb/s. To further optimize the display quality and power dissipation, this device is equipped with seamless display refresh rate switching and progressive to interlace timing switching capabilities. The CH7038B’s HDMI receiver and transmitter are designed to meet HDMI Specification 1.4 and DVI Specification 1.0. The transmitter performs serialization and transmission of video/audio data up to 4Kx2K with the internal powerful scaler engine. On-chip HDCP cipher engine can be activated to protect the high definition media content.Dual channel LVDS receiver and transmitter are incorporated into the CH7038B. The Panel protection mechanism is also built in to switch off the LCD instantly through device’s automated panel on/off sequences if input data is missing or unstable. The backlight on/off control can be configured through programming internal registers. A built-in PWM generator can be used to adjust display brightness and dimming of the LCD. Dithering algorithm is implemented on chip in support of 18-bits LCD panels. To support legacy analog displays, three high-performance 9-bit DACs along with separate horizontal and vertical sync outputs are used. CH7038B can output analog RGB signals for VGA monitor, YPrPb for HDTV and CVBS / S-Video for SDTV.To support local digital audio input and output, the device has both SPDIF and 2-channel I²S digital audio interfaces. Like the video signal path, the audio path can take inputs from DP, HDMI, SPDIF and I2S sources and repack the data for the chosen outputs. Its high fidelity audio engine can handle sampling frequency for up to 192kS/s of stereo and 7.1 audio. The SPDIF interface supports PCM encoded data and compressed audio including Dolby Digital and DTS. In summary, the CH7038B is a general purpose display interface converter. It is designed to handle both advanced and legacy display interface standards. It can be used in universal docking stations for phones, tablets, personal computers, OTT and IOT devices for both the office and the home markets.